Attachments are the components which are detachable and can be mounted at the time of need for a particular operation. Capstan and turret machine will become paralyse without them. Attachments of one machine should not be used on other machines. The range of work that may be carried out on these machines \s dependent upon the equipment available for setting up, but with a reasonable complement of tools and accessories a wide variety of 'Work may be undertaken. As the machines have developed, their makers have added attachments and accessories with the object of widening their usefulness. Described below are some of the most commonly used attachments. 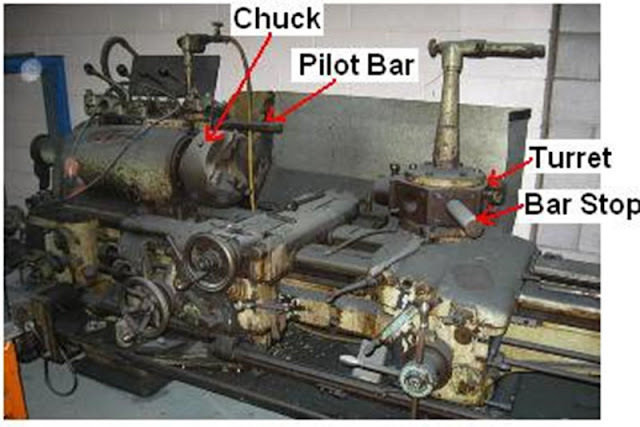 (a) Bar Stops - When the work is produced from a bar fed through the spindle a stop is held in the turret and the bar is brought forward to a fixed position to locate the bar end against the bar stop. This ensures that the amount of stock projecting from the spindle is constant for every component and if all the tools are fed with reference stops, they will produce uniform components. These stops are usually adjustable type. 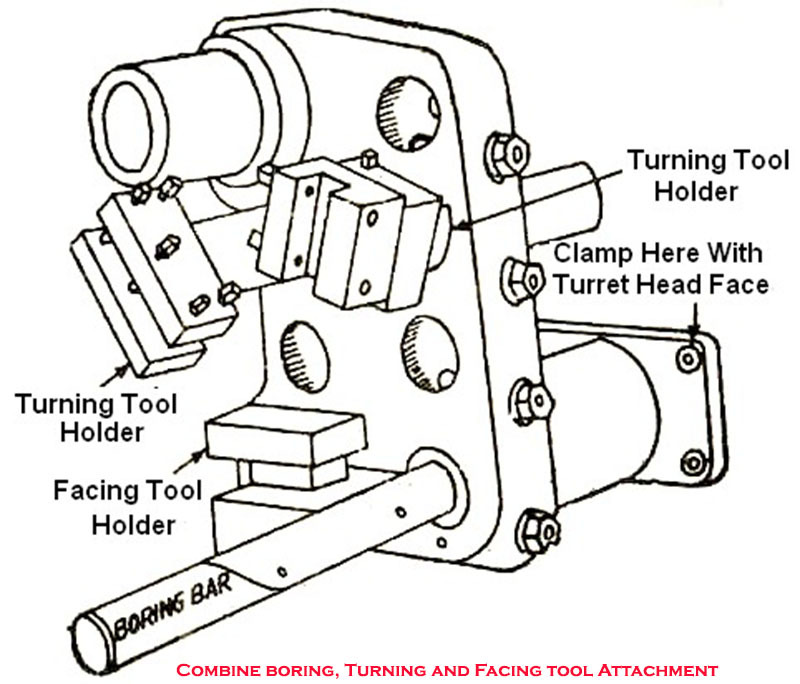 (b) Roller Box Turning Attachments - Roller box turning attachments are generally used for turning lengthy jobs. 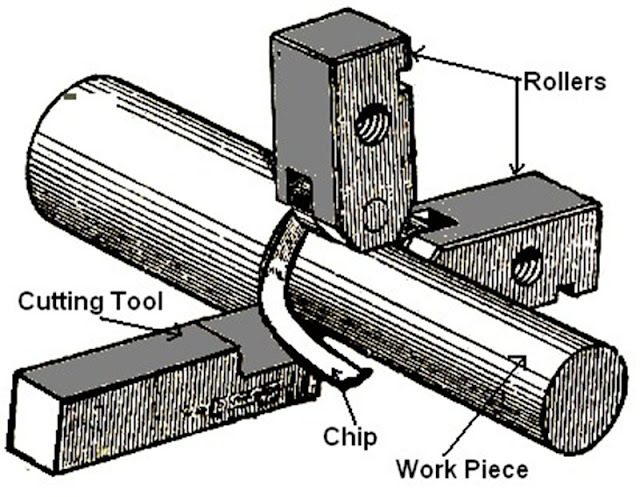 It consists of a cutter (tool) and a work support (two adjustable rollers), all combined as an integral unit. The support may be in the form of Solid-V or rollers, but rollers are more commonly used. Support rollers may either lead or trail the cutting tool and these avoid the deflection of work pieces. When the work has been machined previously, then rollers are used leading the tool so that concentricity is maintained. When the roller trails the tools this often brings about an improvement in surface finish due to burnishing action between roller and machined surface. The main advantage of using this tool is that large reductions in diameter and a well-finished surface within close limits of accuracy can be achieved. It is preferred for machining brass and other free-cutting materials. (c) Combined boring, Turning and Facing Attachment - It is somewhat like a knee turning tool with the difference that it is a larger unit. Normally, four tools can be mounted, i.e. one for boring, one for facing and the remaining two for turning which can be set to the work one after the other simultaneously on different diameters.